Thank you to all of our amazing students, staff and families for another great year of learning throughout Stillwater Area Public Schools! We hope you have a wonderful and safe summer. 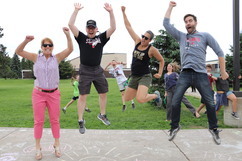 Read the end-of-the year Talk of the District column for reflections on the school year by Superintendent Pontrelli. Teachers are finishing up grading for the final semester. Report cards will be available through Skyward next week. Many school offices will be closed this summer. Please contact the individual school for its summer hours or call the district receptionist at 651.351.8340 for assistance. Looking for things to keep your kids busy this summer? Check out our Community Education summer offerings for classes, sports camps and more! Elementary students (K-5) will start school on Wednesday, August 29 to allow parents time to attend a 30-minute Ready, Set, Go! Conference with their child’s teacher on August 27 or 28. We are excited to expand the conferences to all elementary students and families this fall. Last year, our schools piloted the conferences with incoming kindergarteners and due to the positive response, all students grades K-5 will now have the opportunity. Read more on our website. Students in grades 6 and 9 will start school on Monday, August 27 to allow them to attend a special orientation day in their new buildings. Students in grades 7-8 and 10-12 will begin school on Tuesday, August 28. 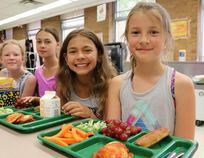 Stillwater Area Public Schools will be offering free breakfast and lunch to area children (2 to 18 years old) this summer at Andersen and Lily Lake elementary schools, thanks to special federal funding. The goal of this program is to make sure all youth in our community have access to nutritious meals while school is out for the summer. Families will not be asked to fill out any paperwork and no names will be taken – kids just need to show up to eat! Meals start at Lily Lake on Wednesday, June 6. See menus, date and times online. More than 660 Stillwater Area High School students will be graduating on Saturday, and you can join in the celebration by watching the ceremony live online beginning at 7 p.m.
Valley Access Cable TV will also be streaming the commencement on their Facebook and YouTube channel. The ceremony will be rebroadcast on Cable Channel 15 at a later date. Watch for photos on the high school Facebook page as well. Congratulations to the synchronized swimming team who placed second at state! In 45 years of competition the Ponies have either come in first or second place - with 18 championships and 27 runner-up finishes. Two Ponies were named All State: Sophie Ogaard and Grace Zimmer. 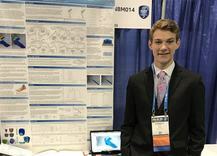 Congrats to Stillwater Area High School junior Everett Kroll who won first place in the Intel International Science and Engineering Fair. Kroll was among 1,800 high school students from 75 countries participated in the world's largest international pre-college science competition which was held in Pittsburgh. Kroll earned a First Award in biomedical engineering for his project to create a prosthetic foot that can be made inexpensively on a 3D printer. The award netted him $3,000. Stillwater Area High School senior James Wagner was among just 16,000 high school students from across the country named a National Merit Finalist. Each year about 1.6 million students apply, but only one percent of them are recognized for their academic accomplishments. Wagner was one of 1,000 finalists awarded a corporate-sponsored National Merit Scholarship. He received $2,500 from W.W. Grainger, Inc., which he will apply towards tuition at the University of Minnesota. Stillwater Area High School junior Haley Jostes has been named a STEM Scholar of Distinction by the Minnesota Department of Education. She was one of just 53 students honored in the state. Jostes was recognized for her science project: Using Ceratophyllum Demersum as a Water Filter and Fertilizer in an Organic Farming Cycle. She also attended the Intel International Science and Engineering Fair along with 1,800 high school students from 75 countries. 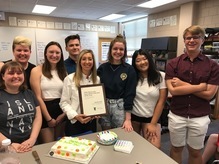 Stillwater Area High School teacher Rachel Steil has been named Minnesota Journalism Advisor of the Year. Steil who teaches English and serves as an advisor to the Pony Express newspaper was surprised by a visit from Associate Director of National Scholastic Press Association Gary Lundgren. Several SAHS staff, along with past and present students were on hand as she was presented with the award. Under Steil’s leadership, SAHS student journalists have ranked among the top in the state and nation. Stillwater Area Public Schools has adopted the state's Model Plan for Reducing Lead in Drinking Water. In 2017, state legislation was passed requiring public school districts and charter schools to test for the presence of lead in drinking water. In April 2018, the Minnesota Department of Health (MDH) and Minnesota Department of Education (MDE) jointly released Reducing Lead in Drinking Water: A Technical Guidance and Model Plan for Minnesota’s Public Schools. This plan ensures that each of our buildings will be tested for lead in drinking water at least once every five (5) years and results shall be communicated. For more information, please visit the Lead in Drinking Water page on our website. Stillwater School District taxpayers are getting a good value for their dollars. The chart below shows that our residents pay less in school taxes on a $250,000 home than most of our neighbors. We work hard to provide a high-quality education with limited resources. The school board will hold a work session for the purpose of discussing the district’s finances and discussing the process to fill the school board vacancy. This work session will begin at 4 p.m. on Thursday, June 7 at Stillwater City Hall, 216 North 4th Street, Stillwater, MN. The June 7, 2018 finance work session originally scheduled to be held at 4 p.m. at Central Services, 1875 South Greeley Street will now be held at Stillwater City Hall.